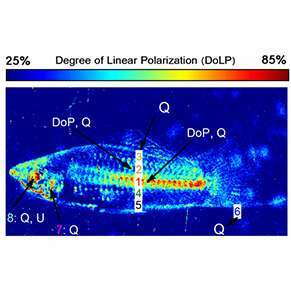 A video polarimetry image of a large male northern swordtail in false color shows the differences in polarization on its surface. We have all seen a peacock show its extravagant, colorful tail feathers in courtship of a peahen. Now, a group of researchers have used a special camera developed by an engineer at Washington University in St. Louis to discover that female northern swordtail fish choose their mates based on a similar display. Marine biologists at the University of Texas at Austin used a bioinspired polarization camera developed by Viktor Gruev, PhD, associate professor of computer science & engineering at Washington University, to make the discovery. His camera has been used in other applications in marine biology and also is now being used at the School of Medicine to help physicians and researchers see cancer cells very early in development. In the new study, the researchers found that female swordtail fish are attracted to certain patterns, called polarization ornaments, visible in polarized light in large male swordtail fish. "There is a lot of social interaction among the fish," Gruev said. "We saw the female fish checking out the large males and looking at their polarization ornaments. During the whole courting behavior, the more polarization a male has, the higher the chance for mating." Various animals can detect polarization, or the alignment of light waves in a plane. Previous research found polarization sensitivity in invertebrate animals, including octopus, but this is the first research to find polarization behavior in vertebrate animals. The research was published online Sept. 2, 2014, in the Proceedings of the National Academy of Sciences Early Edition. Gruev's camera is similar to polarized sunglasses, which reduce glare by blocking polarized light. The camera is built with nanomaterials inside the camera, allowing it to capture the polarization properties of light in real time. "We changed the polarization so that the large males with high contrast showed good contrast in their polarization ornaments," Gruev says. "When we suppressed the polarization ornaments externally with light, the females didn't pay attention to the males. When we changed the light sources to change the polarization signals on the fish body, the social interactions between female and male swordfish significantly increase." Gruev is an expert in polarization and signal processing. The camera is a replication of the visual system of the mantis shrimp, which is among the most sophisticated vision of all animals. Gruev and several other researchers from Washington University also recently published a review paper in the Journal of the Proceedings of the IEEE on bioinspired polarization imaging sensors and their applications in biomedicine.